This is one of two Daz Cat pieces I found on a recent lunchtime walk to the Cumberland Basin. It was good to find this, as I haven’t seen one of his pieces for a little while. This particular spot does seem to be a favourite haunt for the artist. This cat is so full of expression, I like the little black line across the teeth which ‘suggests’ individual teeth without actually picking them out. A neat trick. The absence of one eye might lead the viewer to conclude that this cat is a bit of a bruiser. Nice work. Although he specialises in cats and dogs, Daz Cat also occasionally produces these somewhat surreal pieces that contain his styling and preferred colours and so are unmistakably his work. I’m not too sure what is happening here – monsters or mutant cats or dogs…who knows? for me there is a ‘War of the Worlds’ thing happening here, but I think that is probably my fertile imagination extrapolating the piece a little too far. Fun work from Daz Cat. I seem to have posted a lot of work by Daz Cat recently, perhaps he is going through one of those productive phases that street artists seem to go through – perhaps a bit of time on his hands just now. A cat in a shirt, who’d have thought? I like Das Catz’s work a lot, it always has a bit of edge, and the characters, mostly cats and dogs, often have a little menace about them. In this piece, there is something compelling about the buttons on the shirt, my eyes are drawn to them. The piece simply wouldn’t balance properly without them. 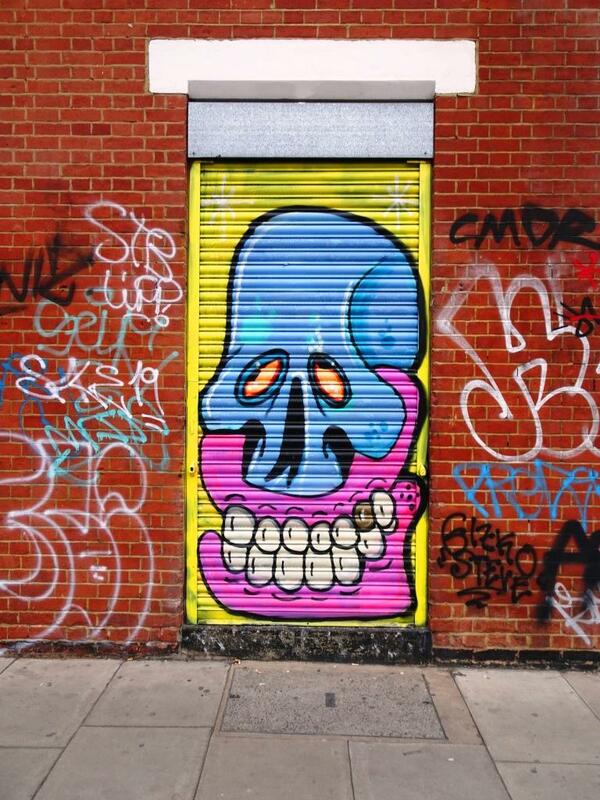 One of the things I admire about street artists is that they tend to have a distinctive style that they carry through all of their work – this becomes more obvious when you group their works together in galleries, which I have started doing with Aspire, 3Dom, Mr Draws, Andy Council and Deamze. In this case the work of Daz Cat has such a strong expression that even when his work doesn’t feature a cat or a dog, it is still utterly unmistakable – this is one artist who doesn’t need to sign his work. This piece ‘Haven’t a clue what’s going on!’ is a little unusual and slightly unsettling, but nicely conceived and very nicely executed. I wonder if the sentiment is expressed about the Council’s stance to restrict the street/graffiti art in The Bearpit…of course it might have nothing to do with that at all. Another nice piece from Daz Cat. Another unmistakable feline portrait by Daz Cat, this one is on the path on the south side of the River Avon near Cumberland Basin. I don’t think that this is his best work, but even a quick one like this requires a lot of skill. I can say this with some authority, having hadf my first two hours with a spraycan earlier on today (as I write this post (about three days ago)). I can’t quite figure out what the thing growing out of his face just above the mouth is, but it looks like a mouse tail to me. This is a great wall in a fine location, but not one that gets a lot of attention (I think). I’ll have to drop by soon for another look. One of the nice things about ‘coming out’ about discovering a new artist is that you can trawl through all your old images and start to post some of their older work, and so it is with Daz Cat whose pieces I have only been posting for the last two or three months. This great cat face in one of The Bearpit tunnels is from November last year and is a really good example of the work of this artist. I always feel that his work is quite simple, but take a closer look and there is a lot of detail and finessing in there. This is a great example of themed work and a distinctive style. I love this wall. It is next to a bus stop in Stokes Croft, and the hoarding was erected about two years ago or more around a building that had been a rather hip bar. For an eternity, it seemed, nobody tagged or sprayed the wall, but slowly the inevitable succession of vandalism and creativity emerged, and the hoarding has become part of the furniture for some of the more adventurous artists. I believe the owner of the site is not overjoyed. This is a nice piece from Daz Cat, who once again presents us with a dog and not a cat although I think it is a very fine dog and not too unlike my own cocker spaniel. Sprayed at the time of Trump and May joining forces to bomb Syria, the message here is loud and clear. Definitely bomb walls not Syria. Much of the work here is pretty rubbish, but every now and again we get a gem like this one.